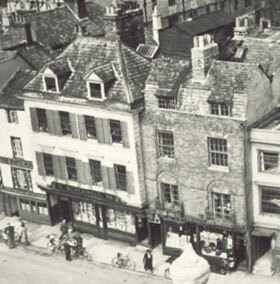 Blackwell’s main bookshop is comprised of four old shops in Broad Street: Nos. 48, 49, 50, and 51 (running from right to left in the above picture). All four are Grade II listed buildings: the pair of houses on the left (51 and 50) date from the early eighteenth century (List Entry No. 1047351), while the pair on the right (49 and 48) were rebuilt and only date from 1936 (List Entry No. 1047352). Most of Blackwell’s cannot be seen from the street, as its vast basement extends under Trinity College’s quadrangle. Nos. 48 and 49 became dangerous when their immediate neighbours to the east were demolished to make way for the New Bodleian Library in 1936. Blackwell’s managed to get a building lease of the site of 48, 49, and Bliss Court (which ran between 49 and 50) at an annual rent of £155, for eighty years from Trinity College. The dangerous shops were demolished, and the right-hand half of the present shop was rebuilt to include the large area of Bliss Court, whose remaining tenants were rehoused. Bliss Court was painted by J. A. Shuffrey in c.1907 (OXCMS: 2002.74,87, pictured on p. 473 of Lauren Gilmour and Margaret Shuffrey, J. A. Shuffrey 1859–1939: An Oxford Artist’s Life Remembered). Above: the front of John Chaundy’s shop at No. 49 shored up during the demolition process. There were given to the parishioners of St Mary Magdalen by George Owen in the sixteenth century, but they sold them to Trinity College in about 1920. 1851 census No. 48 was occupied by Susanna Seckham (right), a dealer in glass and china, her spinster daughter, and their servant; she had been here since at least 1839 and remained here until her death in 1862. Next door at No. 49 lived Charles Lobb and his wife Mary: aged 57 and 62 respectively, they are incongruously described as haymakers, but they must have been doing well as the kept a servant. In the middle of the four shops was a passage leading to Bliss Court, where in 1881 fifty people lived crammed in nine houses stacked beside what is now the right-hand side of Blackwell’s. 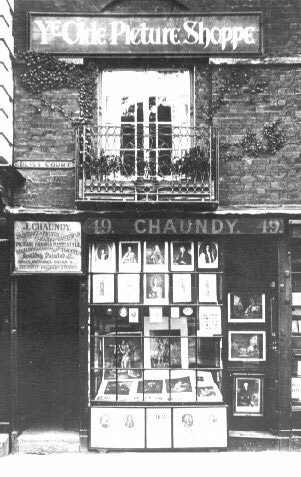 The passage to the court shows up clearly in the picture below of John Chaundy’s picture shop (reproduced with kind permission of Sue Chaundy). In 1881 the eponymous W.H. & J. Bliss, painters & plumbers, occupied Bliss Court behind, along with John Parr, a tailor, and Charles Mathews, an engraver. These belonged to the city from 1549 until the 1930s. 1851 census John Bradfield, a glazier and plumber, lived at No. 50 with his wife and five grown-up children (two of them described as plumbers themselves. No. 51 was occupied by John Lockwood, a master tailor employing six men, with his wife, five young children, and a general servant. 1881 census The widowed Mrs Ann Blackwell lived at No. 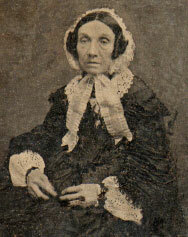 50 with her son Benjamin H. Blackwell, aged 32, described as a “Bookseller master employing one apprentice and one boy” and one servant. The tailor at No. 51 had died recently, and his daughter, Miss Mary A. Lockwood, was continuing to run his business. She lived in the house with her two-year-old nephew, and an undergraduate boarder. 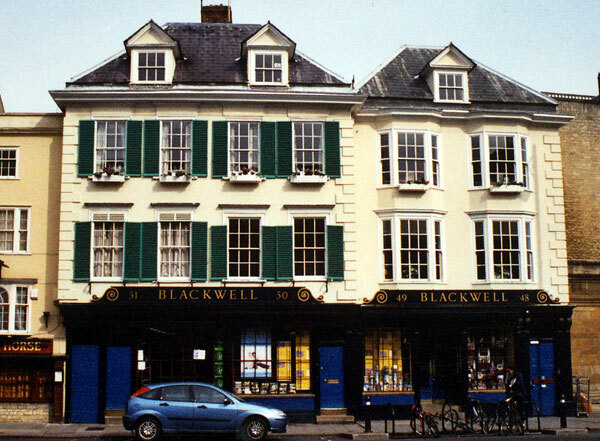 Blackwell’s began life in just one of its present four shops: No. 50 (second from the left). Benjamin Henry Blackwell’s father, Benjamin Harris Blackwell, had been a secondhand bookseller at 46 St Clement’s Street since 1845, before coming the first City Librarian. He died when young Benjamin was 6, and the latter was apprenticed to Charles Richards, a bookseller at 104 High Street, at the age of 13. 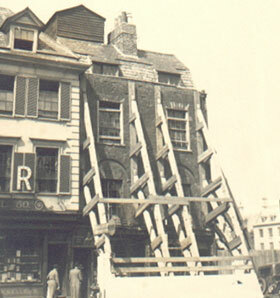 He bought the freehold of 50 Broad Street and opened this shop on New Year’s Day 1879. Half England’s scholars nibble books or browse. Romantic bays, where iron ladders wind.